Days after a “sting operation” purportedly showing bank officials helping launder money, India’s three leading private sector banks have initiated internal measures to conduct investigations. HDFC Bank said Saturday it has hired independent audit firm for conducting a forensic inquiry while Axis Bank has initiated a probe into the matter. Boeing Co said Friday its 787 Dreamliner jets could be airborne within weeks using a new battery system that includes safeguards against overheating, a prediction that drew scepticism from some regulators and industry experts. 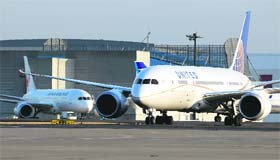 Boeing’s 787 Dreamliner jets parked on the tarmac at an airport in the United States. I have invested Rs 1 lakh in my wife's name in a recently offered single premium insurance plan. However, after reading more about this cover, I feel I have been taken for a ride by the fine print in the terms and conditions. Is it possible to cancel my policy and withdraw the funds at this stage? The sting operation by the online news provider claimed that staff at ICICI Bank, HDFC Bank and Axis Bank were helping customers do deals that violate various laws and regulations. "The bank has appointed accounting and audit firm Deloitte Touche Tohmatsu India to carry out an independent forensic inquiry into the allegations and reported statements, as made by Cobrapost representatives, when secretly taping bank officials," HDFC Bank said in a statement. Besides, the bank has also appointed Amarchand & Mangaldas & Suresh A Shroff & Co to examine the breaches, if any, of the bank’s Code of Conduct & Ethical Standards, by any bank officials, it said. HDFC Bank has also suspended 20 officials concerned till investigations are completed, sources said. On Friday, ICICI Bank suspended 18 officials concerned till investigations are completed. Earlier this week, the portal Cobrapost had played the contents of a purported video recording of officials of private banks including Axis Bank, allegedly agreeing to receive unverified sums of cash and put them in their investment schemes and benami (in the name of another person) accounts in violation of anti-money laundering laws. The footage taken in ‘Operation Red Spider’ purportedly shows a number of senior executives of the three banks verbally agreeing to take huge amounts of cash from the undercover reporter and putting them into a variety of long-term investment plans so that the black money ultimately is converted into white. However, neither any account was opened nor any cash was deposited in these banks. HDFC Bank further said internal departmental enquiry is underway to verify the truth or untruth or correctness, as the case may be, in the reported tapings of bank officials. "The bank is committed to the highest standards of compliance, corporate governance and ethics, and has in place systems and procedures to ensure that its business is conducted in compliance with laws and regulations," it said. The statement further said internal departmental enquiry is underway to verify the truth or untruth or correctness, as the case may be, in the reported tapings of bank officials. Meanwhile, Axis Bank also said the findings of enquiry are expected shortly and a senior-level committee has been constituted to monitor and supervise the entire investigation process on a daily basis. Japanese regulators immediately warned that the timetable was impossible to predict, in part because investigators still do not know what had caused lithium-ion batteries to overheat on two 787s. "At this time we are not yet in a position to say when flights will restart," said Shigeru Takano, the air transport safety director at Japan's Civil Aviation Board (CAB), which will assess and approve Boeing's proposed fix. Boeing's confident assertion marked a shift from the May or June dates expected by airlines, and appeared to pressure regulators to quickly approve the new battery safeguards. Industry sources said U.S. regulators have signalled they expect a lengthy testing schedule sufficient to ensure the refitted, carbon-composite plane is safe. Boeing's timetable also put the company at risk of missing a deadline if approval takes longer than expected, adding to a history of missed deadlines that has bedevilled the Dreamliner. For any life insurance cover, entry is easy but exit entails a heavy loss. The loss is so heavy that it becomes necessary to stay put. Fortunately, most insurance plans have a free look period that ranges from 15 days to a month. The policy can be cancelled or reversed if you were to change your mind during this period. Check this clause in the case of the particular plan you have subscribed to. I am a central government employee. In our salary structure the transport allowance is Rs 3,200 and it is double that for the handicapped. Is this allowance fully or partially exempt from income tax? An allowance for travellingbetween one’s residence and place of work is exempt up to Rs 800 per month. For an employee who is blind or orthopedically handicapped with a disability of the lower extremities, this limit has been fixed at Rs 1,600 per month with effect from August 1, 1997. I am supposed to be laid off from the company at the end of the month. I am being paid three months salary and am supposed to get bonus (I will be getting Rs 154,000). At present my taxable income is Rs 200,000 and have made an investment of Rs. 58,000. Would you please advise me what will be the amount charged to tax? Even if the extra money is paid to you, not for services rendered but as compensation for the layoff, it will be fully taxable as salary. Hence your total income for the year would be Rs 354,000. You can invest an extra Rs 42,000 under Sec. 80C so as to reduce your taxable income to Rs 2.54 lakh. The Indian rupee rallied for the second straight week, appreciating by another 27 paise to end at two-week high of 54.01 against the US dollar on sustained dollar selling by exporters and some banks amid continued capital inflows. At the interbank forex market, the rupee began on a weak note at 54.42 a dollar from last weekend's close of 54.28 and moved erratically on alternate bouts of demand and supply in a range of 53.97 and 54.5325 before ending the week at 54.01, a gain of 27 paise or 0.50%. 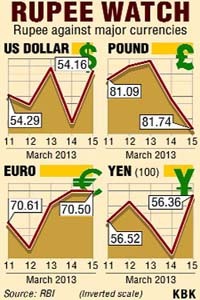 Last week, it had risen by 61 paise or 1.11%. Bank of America Corp said Friday that Mukesh Ambani, chairman of Reliance Industries Ltd, will step down from the No. 2 US bank's board of directors at its annual shareholder meeting in May. Ambani joined the bank’s board in March 2011, bringing global experience to a bank known for its US consumer business. He will take a seat on the bank's new, non-fiduciary global advisory council made up of 13 business, academic and policy leaders. Ambani, 55, joins former Morgan Stanley executive Robert Scully in announcing plans to leave Bank of America's 18-member board this spring.